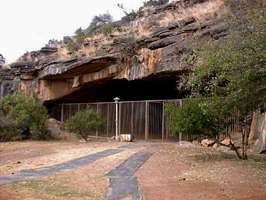 Wonderwerk Cave in South Africa contains stone tools dated to two million years ago, possibly knapped by Homo habilis. It lies about 43km north of Daniëlskuil on the road to Kuruman, and is about 43 km south of Kuruman, on the farm "Wonderwerk", which means "miracle". Permanent water sources in the area are presently limited to a seep some 5 km to the south on Gakorosa Hill and a large sinkhole now known as Boesmans Gat (meaning "Bushman's waterhole"), about 12 km away. History of the cave below and the photo above from http://www.showcaves.com/english/za/showcaves/Wonderwerk.html, photograph of the cave entrance by Andre Grove. 05 July 1844 - first description of the cave by H. Methuen. The first white farmer at Wonderwerk, P. Bosman lived in the cave with his family and afterwards used it as a cart-house and sheep shelter. 1940-1944 - Commercial exploitation of the site for bat guano by N.J. Bosman. 1940-1948 - Archaeological investigations by B.D. Malan. 1974-1977 - Excavations by K.W. Butzer. 1979 - Excavations by J.F. & A.I. Thackeray. 1978-2002 - Excavations by P.B. Beaumont. 1993 - Cave and surrounding land ceded to the McGregor Museum by the Bosman and Nieuwoudt families. 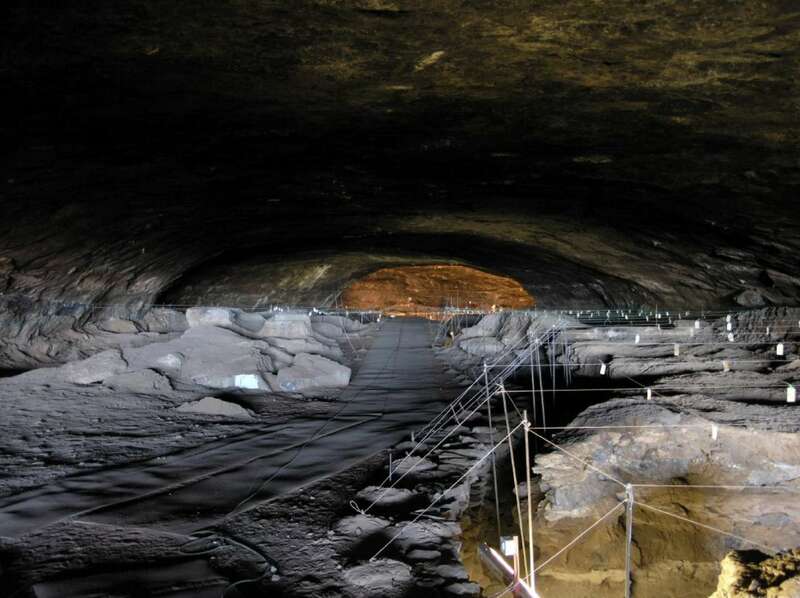 Archaeological research at this massive cave site has revealed an immensely long record of human and environmental history spanning hundreds of thousands of years. The cave and its surroundings, form a conservation area with several features distinctive of the Kuruman Hills. The site is open to the public and includes an interpretative centre adjacent to the cave. The site runs horizontally for 193 metres into the base of a low conical foothill on the eastern flank of the Kuruman Hills. It is a very ancient solution cavity, exposed at its northern end by hillside erosion, in stratified dolomitic limestone belonging to the 2.3 billion year old Ghaap Plateau Dolomite Formation. 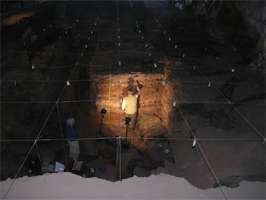 Excavation teams from the McGregor Museum in Kimberley have revealed numerous fascinating artefacts. like stone impliments and engravings, decorated ostrich eggshells, Bushman hair, pollen dating back about 400 000 years, various animal bones and the 8 000 year-old teeth of a now extinct species of horse. Visitors can marvel at the Bushman paintings in mixed media - plant roots and blood. ~ 1.8 million years old, Tanzania. Source: Display, Paléosite at Saint Césaire. Note the matting put down as a walkway, and the complete and professional job of setting up grid squares to make recording of positions of artefacts quick, accurate and easy. The cave was discovered when local farmers dug up large parts of the cave in the 1940's to sell the sediments for fertilizer. 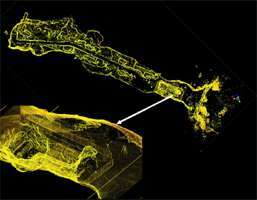 Subsequently a series of brief archaeological excavations began. Peter Beaumont of the McGregor Museum carried out major excavations at the site between 1978-1993. Map of Wonderwerk Cave generated by 3-D scanning carried out by Heinz Ruther of the Department of Geomatics, University of Cape Town. The inset shows a view of the front excavation area where the dating project took place. 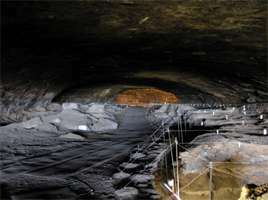 The cave formed by water action in the Dolomite (a type of limestone rich in magnesium, chemical formula CaMg(CO3)2 , calcium magnesium carbonate) rocks of the Asbestos Hills. This rock formation is over 2 billion years old, some of the oldest rock on earth, so we do not know when exactly the cave formed. It is 130 metres long. Using a combination of dating methods it has been possible to date the bottom level reached by Peter Beaumont in the front part of the cave to 2 million years ago. 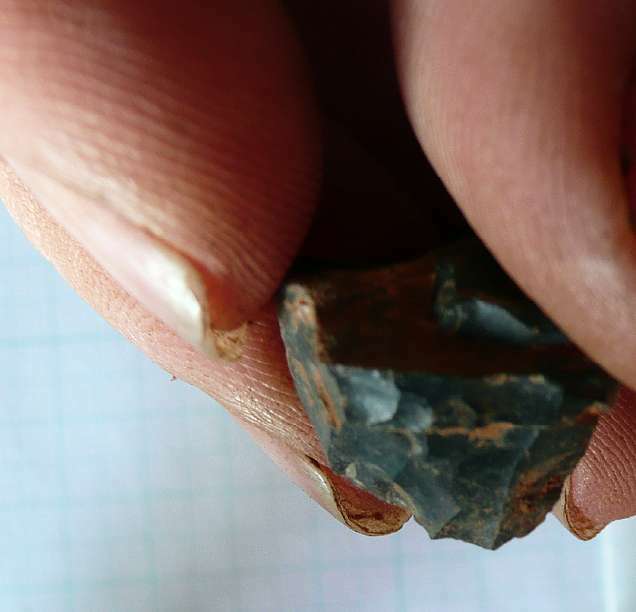 A small number of very small stone tools have been recovered from excavations in this level. Geological evidence indicates that these tools were deposited in the cave by human ancestors, not washed into the site from the outside. The combination of stone tools indicating the presence of human ancestors and the dating of the level leads to the conclusion that human ancestors (hominids) were in the cave 2 million years ago. 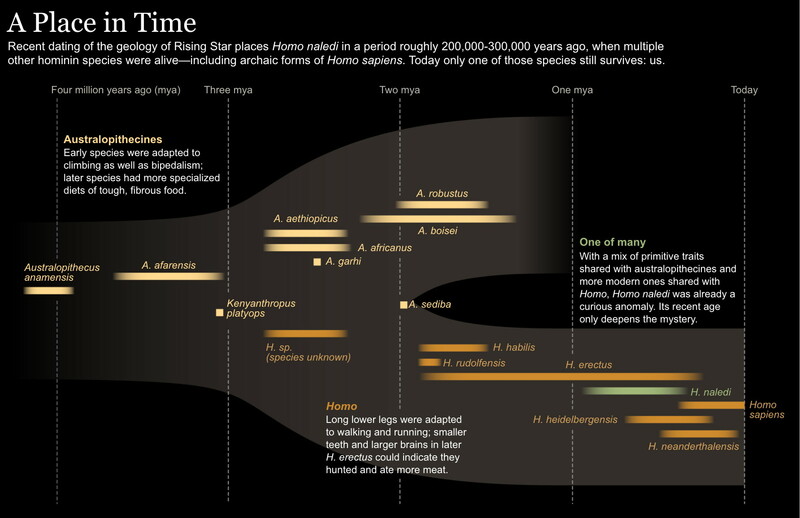 This is the earliest evidence for intentional cave occupation by human ancestors. There were a number of species of hominids in southern Africat 2 million years ago. The most likely candidate as the manufacturer of the stone tools found at Wonderwerk is Homo habilis. The research team was led by Michael Chazan (University of Toronto) and Liora Kolska Horwitz (Hebrew University) in collaboration with the McGregor Museum. Hagai Ron taking samples from the section at Wonderwerk Cave. The oldest known stone tools from sites in Ethiopia date to 2.4 million years. The Wonderwerk Cave discoveries are those close in age to the very earliest known stone tools and similar in date to the bottom levels at Olduvai Gorge. Hagai Ron of the Hebrew University took small samples of soil from the entire sequence (over fifty samples). These samples allowed him to measure changes in he earth's magnetic field and to correlate the Wonderwerk sequence with a global timescale for changes in the magnetic field (known as reversals). Ari Matmon, also from the Hebrew University, took soil samples and carefully prepared them in the lab. He then sent these samples to an atomic accelerator in the United States where a procedure to measure isotopes, much like the method used in carbon dating, was carried out. Unlike carbon dating, Cosmogenic Burial Age dating can provide very old dates. Why was this so difficult? Most well dated early sites are in East Africa where there are volcanic ash layers that can be dated using the Argon method. In southern Africa we lack these ash layers so that we need to develop new methods. 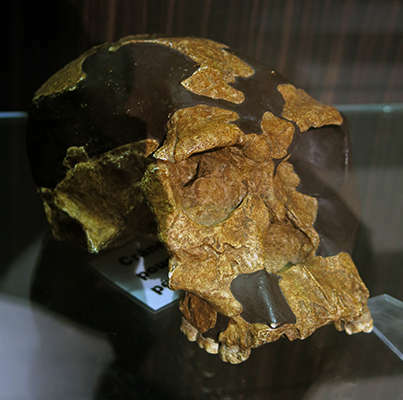 The first use of Cosmogenic Burial Age dating in South Africa was at the Cradle of Humankind. Our results show the value of this method, particularly when combined with Paleomagnetic dating, for archaeological research both in the region and globally.